Her father is gone! Taken by the Queen of Compara’s agents. Mara has to rescue him before the Queen tortures and kills him. Instead of the kind, loving father she’s always known, he’s become demanding, critical, with impossible expectations—not just as Father but also as the only teacher in their frontier outpost. Mara would rather scoop zircan poop than listen to another boring lecture about governments on Central Planets. Give her a starship engine to take apart or, better yet, fly, and she’s happy. Now, he’s gone. Never mind, they’ve had a rocky road lately. Never mind, Father promised she could go off planet to Tech Institute next month when she turns fifteen, where she’ll learn to fly starships. Never mind, she ran away because she’s furious with him because he reneged on that promise. Father is her only parent. She has to save him. 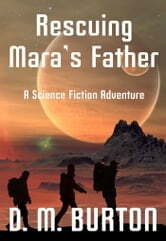 Along with her best friend, eleven-year-old Jako, and his brother 15-year-old Lukus, Mara sets off to find her father. Her mentor, old spaceport mechanic, seems to know why the Queen captured Father. In fact, he seems to know her father well. But, does he tell her everything? Of course not. He dribbles out info like a mush-eating baby. Worse, he indicates he’ll be leaving them soon. And Lukus can’t wait to get off our planet. Mara’s afraid they will all leave, and she’ll be on her own. Despite her fears, Mara has to rescue her father.